Hey everybody, Beat♫ here, I'm restarting this RP again with a clean slate. For those of you that were in the previous one, feel free to use the characters you had there. I am going to. My co-host for this game is Ryan Carbuncle . Summary: A huge event is happening in the Japanese town of Aurakako a yearly event that happens every year. A Fashion Extravaganza with multiple things to do. The whole thing takes place in Zodiac Square. 1) No God-modding, Metagaming, or One-liners. a) God-modding: Controlling another characters player without permission and declaring what damage is done from an attack. Attacks are permitted to auto-hit bit damage can't be declared. b) Metagaming- Using Game, Site, or Plot Information to your advantage before it is revealed in Game. c) One-liners- this one is self explanatory. Other players need enough information to post off of. 2) Treat others as you wish to be treated. 3) There is no character limit, however don't let your characters take over an entire scene in the RP. 4) Precure All Stars/Precure Dream Stars Time Line: The age the Cures were at the end of the series or before a future event. 14-17 for Canon Cures. OC and Crossover Cures can have varying ages. 5) Don't Forget to Have Fun!!!!! 6) If at anytime you no longer wish to participate in the RP, please PM either Beat♫ or Ryan Carbuncle so we don't wait for days on end for you to post. KKPCALM: Same Age as they are in the show. Episode 01: Gathering of the Heroic Defenders! In Zodiac Hall, eleven out of the twelve Zodiac Cures were gathered around the table for a meeting milling over what has happened to them so far. Pisces had decided to go back home and only return to the Zodiac Hall if there was an emergency. The assembled Team was looking through a slide show of what has happened to them so far. That's where the story begins. It has been an eventful few years for the Zodiac Team. First they met a Cure Team from the nearby town of Decalo City, then they found out their three Fairies were actually Cures themselves. 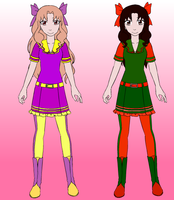 Thirdly, they met Hoshiko and Izumi who turned out to be Cures Capricorn and Cancer respectively. Fourth they met someone by the name of Tammy who turned out to be Cure Pisces with her Fairy Partner Riki. 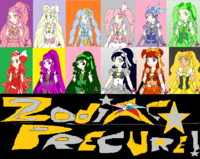 Finally, the Zodiac Team of Twelve Cures got their first upgrades to their uniforms and transformation devices. They now all twelve had the same devices and transformation phrases. Akiko: *Finished sending out invitations to some good friends of theirs for the 1st Annual Zodiac Festival. She read up on all the recent and veteran Cure Teams, Sailor Senshi, other Warriors and Cures and where they hang out at and sent invitations to those cities as well. This was going to be a big festival. Hopefully, it will go smoothly, but her and her team are Cures, nothing ever goes smoothly for them. * "I can't wait to see Ryan and his friends again. It will be nice to see them again after so long." Chisame: "I agree with you Kiko-Chan. We had a great time with them when we were in their town. I hope they respond positively to our invitations." Kasumi: *Tsundere Tone* "Do you actually think that Ryan and his friends will accept their invitations? We probably aren't even worth their time." Sayomi: *Glares at Kasumi* "Watch your attitude Kas-Chan. Of course they would want to see us." Kasumi: *Sweat Drops and blushes out of embarrassment. * "Sorry." Amaya: "It will be nice to actually meet them. I'm sure Zumi-Chan will be thrilled to meet some new friend." Arina: "I can't wait to meet new friends. I didn't really have many friends while under Queen Ophiuchus." Narumi: *Follows Kazumi's lead and switches to her Fairy form and perches on Arina's other shoulder. * "Agreed. I'm also glad we finally got reunited with Izumi." Kaminari: *Also switches to her Fairy form. * "It was nice to meet Riki-Chan, and Tammy-Chan as well." *Perches on Arina's head. Arina: "I can't help but wonder if we will have a big turn out for this festival." Suddenly an E-mail appeared across the screen it was from Ryan and his team. The currently present Zodiac Team giggled as they read it. They were so happy. Their close friends the GemFlash Team had accepted their invitation and said they would arrive at the Aurakako Train Station..
Akiko: *Squeals happily as she sends a reply back. * E-mail Reply: What time will your train arrive? *Looks toward Izumi and Hoshiko* "Would you two like to come with us to meet Ryan and his friends so you can meet them?" Two girls arrive in Zodiac hall: Makoto Kino and Stephanie Sanders. The two girls walk into the room and Makoto yelled, "I hope were not late for anything...we wanted to see you all again." Stephanie said, "YEP YEP..hows it going you guys!!" The two then got to them and smiled at them... "Who else is coming huh?" Makoto asked..
A sinister figure was in the basement of a huge mansion surrounded by workers working on machines and creating items for their empress. Maddie stood their impatiently waiting for one of them to come up with something...then it happened... 3 workers called her over and showed her a big version of a toy called a fidget spinner..this one however was different.. They told her that if she threw it that if it hit something or not that it would spin back to her and Maddie being as short as she was looked at first like she couldn't even be able to lift the thing but they assured her that she would be the only one able to lift it and they would help her infuse it with her evil green energy and power. Maddie looked at them happily but asked, "Ok it's evil great but what if one of those brats tried to throw it or handle it?" The worker with glasses stepped up, "Miss Maddie...if one of those idiots tried to handle this it would shock them with a power like thunder...we have designed this to only agree with your energy pattern and your body signals...its useless to those other then you your greatness." Maddie cackled and nodded, "Thank you very much...now lets get back to making more diabolical weapons and maybe some armor...hmmm..."
Olivia Ruvier: had found her way into the forest surrounding the Eclipse Castle. "I can't believe that I was stripped of my powers when Eclipse Virgo took over. Now that Eclipse Virgo is purified I could take my rightful place as Omega Ruby. This time I am so not going to disguise myself as male. That was so totally humiliating. Oh look it's my orb. It looks like it's inactive. Time to take it for myself." Queen Ophiuchus: appears in front of her. "Well look who decided to come back. I was wondering who I would find to take the powers of the Red orb. I will let you keep the orb. Since I'm desperate for a third General now, I will let you take on any form you want. I won't make you disguise yourself as male. Sorry for making you do that. Your first target is that traitor Eclipse Virgo now known as Arina Amaterasu/Cure Virgo. There is an event going on in Aurakako and I hear a lot of Cures may be gathering there. So now, my dear Omega Ruby take back your power and manifest the form that you think will best suit you as my General again. I'm counting on you." Omega Ruby lands in an abandoned Alley and switches to her Civilian form. She then heads home to her parents and ponders how she is going to draw the Zodiac Team and their friends out. Akiko: "Arina, Amaya would you like to come with me and meet the GemFlash Team at the train station?" Akiko: *looks toward Izumi and Hoshiko* "Would you two like to come with us? Nari is coming with us." Daisy packs up some things and heads to the city. "Ugh, I feel so lonely by myself...oh well at least Sakura and Hikaru will join me soon." she whined. "But I'm still a little sad that Rose-san and Seishin can't make it." She looks around the city. "I've never been here before...maybe I can make some friends before Sakura and Hikaru arrive tomorrow morning." *looks at her invitation* "What is this place anyway...?" Outside the Train Station after appearing in an Alley next to it, four young women walk out of the Alley and notice Daisy. The young women are Akiko and Kaminari Denkou as well as Amaya and Arina Amaterasu: they notice Daisy and introduce themselves. Daisy would notic that all four of them have some sort of Wristwatches on their left wrists with various Zodiac Symbols on it. Nari: Kaminari Denkou, I'm one of Akiko-Onee-Chans adopted sisters. Everyone calls me Nari. Amaya: *A bit too quiet for Daisy to hear, but loud enough for the other three to hear. * "My name is Amaya Amaterasu, it's nice to meet you." Arina: *Much louder and more excited than Amaya, but not so loud that the whole city can hear her. * "My name is Arina Amaterasu! I'm one of Amaya's younger sisters! I hope we can be good friends!" Daisy notices the four girls and their watches. "Hello! I'm Daisy Kohaku!" she tells them. "This is my first time here, so I'm excited! My friend Sakura and my sister Hikaru will be coming tomorrow, so I can introduce you to them." She smiles at the girls. Akiko: "Want to come with us to the train station? We are picking up some friends of ours." Nari: "It's very nice to meet you." Arina: *Happily Giggles* "I love meeting new friends! I hope we can become good friends!" "Sure!" Daisy replies. "It's nice to meet you all and I hope we can become great friends!" A little sparkle shines in one of the pockets of her backpack, which is a little unzipped. Daisy doesn't notice. A girl with light pink hair runs up to Daisy. "Daisy-chan!" says the girl. "I'm here early!" Sakura looks at Akiko, Nari, Amaya, and Arina. "Who are they?" she asks. "These are some girls I met just a few minutes ago, Akiko, Nari, Amaya, and Arina." Daisy replies. The four Zodiac Cures introduce themselves to the new arrival. Akiko and her friends gather around Sakura and Daisy as Akiko speaks up while the others smile. Akiko: "My name is Akiko Denkou the girl with pink hair is my adopted sister Kaminari, but she goes by Nari. The other two are also friends of mine, they are sisters too their names are Amaya and Arina Denkou. Would you two like to follow us back to the train station to meet some friends of ours? It's not that far away from here." *Points to a building about 100 yards behind them* "It's that building behind us." Arina: *Excitedly* "How about you come with us! Then will take you to where we hang out." Amaya: *Shyly* "It would be great if you two come with us." Nari: *Nods in agreement with her friends* "You will get to meet some more of our friends. I really hope all six of us become good friends." "Um...I'm Sakura Yuriamai." says Sakura. "I hope to-to become good friends with you all!" "Sakura can be a little shy sometimes." explains Daisy. "What?" asks Daisy, turning towards Sakura." "Nice to meet you Sakura." Akiko said with a curtsy, then continues, "I really hope you will enjoy your time here in Aurakako." "N-nice to meet you too, Sakura," Amaya said shyly also with a curtsy, "w-why don't you follow us to the train station?" "Maya-Chan! Why are you so shy around people?" Arina asked curiously, "you should be happy to meet new people." "Calm down Rina-Chan," Nari said with a smile, then continued, "what Arina means to say Sakura, is that she's happy to meet you too. I am also happy to meet you. Why don't you follow us to the train station." "I-It's nice to meet you too!" replied Sakura. "Glad we're all getting along so far!" cheered Daisy. "Now come on, let's get going to the train station!" The group of six girls arrive in the train station and look at the board and notice that according to the data, the train from Decalo City is right on time. So the six girls head to the waiting area to wait. PA Announcement: "Now arriving on Track 1 the Decalo-Aurakako Express, arriving passengers may be met on Platform 1." Almost immediately after the announcement, the Decalo Aurakako Express came to a complete stop. PA inside the train: "We have now arrived at Aurakako Station, please wait until the train comes to a complete stop. Once the train comes to a complete stop, a single Whistle Blast will signify the De-Training." Soon enough, there was a single whistle blast letting the GemFlash Team know that it was safe to De-train. "Is this the train your friends are on?" asks Daisy. "I can't wait to meet them!" A few hundred feet above the train station, a girl hovers in the air. "This is Cinder. I have visual confirmation, Zodiac is on the ground now." "Understood. Can you confirm how many we're dealing with?" "Negative. I've lost visual contact, they've entered a building. It appears to be a train station." "Can you re-establish a visual without engaging?" "Doubtful. I fear a more direct approach may now be required, I'm picking up more spark signatures from inside the building." "Alright. Standby. I'm on the way." *Daisy thinks* I wonder why me, Sakura, and Hikaru were invited here though...hopefully those girls don't find out about our secret. But why us? Could it be that us and those girls have something in common? The six girls would see four people get off the train. Akiko and Nari are the first ones to see them followed shortly by Amaya, Arina, Daisy and Sakura. Akiko: "Ryan, everyone! Nice to see you again! A lot has happened since we last saw each other! We can explain later." Nari: *Notices the human Pearl and looks at her curiously. Gazing in her eyes. * "You, look so totally familiar. Have we met somewhere before? I feel like I know you. I know the rest of you," *Waves toward Ryan, Suiko, and Akiza knowing that Gold and Silver are hiding somewhere. * "So Ryan, how have you and your friends been?" Arina: "Oh wow! New friends! I can't wait to meet them!" *Rushes over to the GemFlash Team with a big smile on her face and starts to shake hands with everyone. * "My name is Arina Amaterasu! It's so nice to meet you finally! I hope we can become great friends!" "Hey, I'm Daisy Kohaku!" Daisy says. "We just met the Zodiac team and me and my friend, Sakura, are excited to meet you too! I hope we can become great friends!" "U-Uh hi...I'm Sakura Yuriamai..." Sakurs stammers nervously. "I-It's nice to meet you!" "Could you excuse me for a minute, I have something I need to do," Akiko said as she excused herself from the group and went into the girls restroom. Once in the girls restroom, Akiko went to a stall and activated a portable Holographic Keyboard on her Z-Cator and typed in Izumi and Hoshiko's Frequencies. Once she gained access to them, she started typing a text message, "Zumi-Chan, Hoshi-Chan, it's me Kiko-Chan. Arina, Amaya, Nari, and I are at the Aurakako Train Station greeting the GemFlash Cures. We will be here for a while, and at the moment there aren't any innocent Civilians Nearby, so you two can portal into the Train Station via your Z-Cators. We will be waiting for you. P.S. I think that you both will like the GemFlash Team. We also met two new friends as well, they can introduce themselves to you when you get here. Hope to see you soon. "Ladies and Gentlemen now arriving on Track #2, the Sakurako express with direct service from Sakurato, De-Training Passengers may be met on Platform #2 as well." OOC: Crystal Precure Rainbow Team. Akiko then came out of the restroom and smiled at the new arrivals, "Sorry for the disappearance I had to send out some text messages to a couple of friends of ours. Hopefully they will meet us here soon. It looks like we don't have anyone but us in here. We can either show you something or wait until our other two friends get here." OOC: Ryan Carbuncle 's Characters, Cure Amber 's Characters. "More friends of yours? Can't wait to meet them!" cheers Daisy. "this means more people I might accidentally embarrass myself around..." Sakura mutters. It was then that a golden shutter appeared on the ceiling of the Zodiac Hall. It opened up to reveal a portal, and someone flying out of it, curling into a ball and bouncing a few times before landing in the hall. 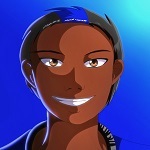 It was a tall black-skinned guy with brown eyes and black hair with a blue streak. It was Vance Brice, a dimensional traveler and adventurer, arriving after using the Gate of Destiny portal. After Vance stood up, he stretched out and looked around, not really recognizing the place at all. "Whoa...where am I now?" he asked himself. That's when he saw three familiar faces. "Stephen! Stephanie! Makoto!" he exclaimed with a wide smile. "Ah, finally some familiar company!" Kazumi: "We only know of two teams coming at the moment, the GemFlash Precure Team and some team called Twinkling Precure. At the moment we aren't sure if the Crystal Rainbow Team or if anyone else is going to join them." Narumi: "We sent out invitations to Ashley and the Galactic Guardians, but aren't sure if they're going to come or not." Kasumi: *Talks in a normal tone* "I think we also sent out some invitations to the other Cure Teams. Though, we aren't really sure if they are going to come or not." Sayomi: "I hope they do come, this is supposed to be a reunion of sorts for us as well as other Cure Teams. As far as I know the only confirmed ones are GemFlash and Twinkling." Makoto and Stephanie smiled back at the other girls then turned to Vance as he ran up. "Hey Vance...good to see you" Stephanie told him. Makoto then said, "Stephen's not here right now..he told me he had some special mission he was going on for some Amelia girl or something..." Stephanie then mentioned, "I hope everything is ok with the other cure teams.."
Akiko, Arina, Amaya and Nari sent an e-mail to Makoto and Stephanie to meet them at the train station as they waited for Ry and his team to answer. Stephanie's phone rang out saying she had an email come in and looked at it smiling. "Come on Jupi love we are needed at the train station" Makoto smiled as then told Vance and the others and walked out heading for the train stations.